The Sucre Hat Museum, or Museo del Sombrero in Sucre, Bolivia, is actually the “Sombreros Sucre” hat factory. Sombreros Sucre has taken note of the great fascination tourists have with the wide variety of regional Bolivian hat styles and now offers a tour of their factory so you can see where all those Bolivian hats come from! When you visit the hat factory of Sucre, Bolivia, you’ll be taken through every fascinating step of the Bolivian hat making process. At the hat factory everything begins with the making of what is called a “fustre” which is an initial floppy, bell-shaped felt “hat” from which all finished hats are later shaped. 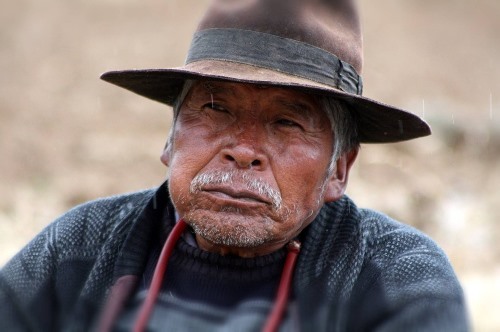 Once the fustre has been made, it is flattened, shaped, dyed, shrunken, stiffened, and detailed until finally, it has been transformed into a hat. During the tour of the Sucre Hat Museum you will be taken through the entire factory and shown the entire process step by step. The hat museum is a real working factory, with huge, functioning machines and you will walk among them and the employees. You should be prepared to get dirty as the floor is often wet and some parts of the hat museum and factory have dye on the floor. Some areas have sludge that smells rather bad and you have to be careful not to disrupt the workers or the process. You should wear comfortable clothing and shoes. The tour costs Bs. 10 per person and takes about one hour. It begins in the factory and ends in the museum. Watch the step by step hat-making process in photos here. It’s fascinating! Hat Museum & Factory Sucre Bolivia Slideshow: BoliviaBella.com’s trip to Sucre was created with TripAdvisor TripWow!